Quelques places, aucun service, parking derrière la police acceptant les caravanes. A few campers no service, parking lot behind the police! Caravans allowed. Two third of us hated the place: We arrived on friday night for an overnight stay. As we fall asleep it felt like a market place. Loud groups were coming and going all the time, drinking and partying next to our car. The whole "show" just ended before dawn. We didn't felt very safe at all. In extrem opposite the place felt very peaceful and secure with nice neighbourhood and a dogpark behind in the morning. We recommend to park directly next to the "resident" campers - this corner seemed much quieter. Mejor de lo esperado. Es un parquing en la calle pero con muy poco trafico y los vehiculos pasan lentos. Curiosamente hay muchisimas plazas pero al ser gratuito parece ser que mucha gente aparca de manera parmanente aqui. Nos ha parecido un sitio seguro para dormir. Veel campers hier. Geen services. Rechte plaatsen. Midden in woonwijk dus laat lawaaierig. Camperplaats staat aangegeven in stad maar ik heb het laatste bord gemist...misschien bedoelen ze de plek 500 meter verderop? 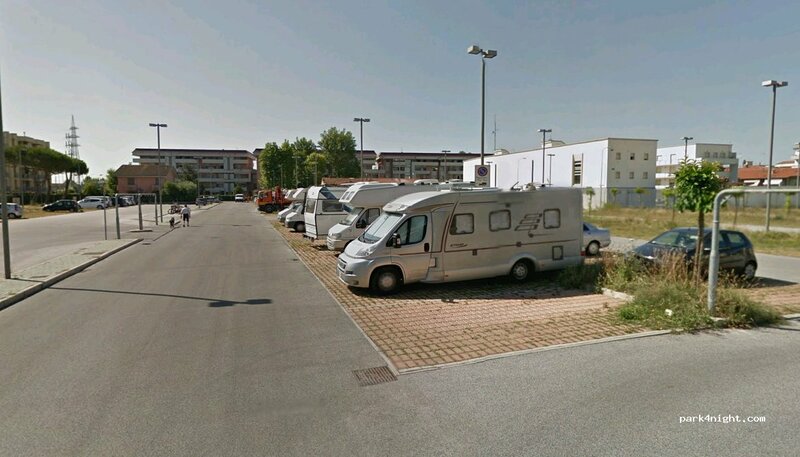 Tranquillo, in zona residenziale senza servizi. Large parking with other campers. Parking meter not working. Near restaurant pizzeria.